Work of the architect Antonio Escario, the ambience of Gran Hotel Bali is enthralling from the moment you enter! 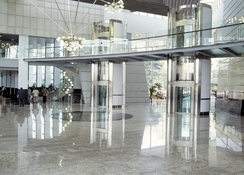 Luminous globes in cluster, profusion of marbles, chromed steel finishes are characteristic of the hotel: all a show, worthy of seeing, and supported, on the outside of the building, by structures culminated in the shape of a pyramid. The hotel features 776 guestrooms and is adapted for the disabled, and features access to the rooms through two panoramic lifts installed here. In the Gran Hotel Bali guests will find 24-hour room service, internet, private garage, three outdoor swimming pools, outdoor whirlpool, solarium, gym, sauna, massage services, several fully equipped meeting and conference rooms - ideal for business meetings, indoor recreation area for children, entertainment programs for adults and children, two bars and four restaurants. And from the rooftop, on clear days, guests can see the coasts of Ibiza. 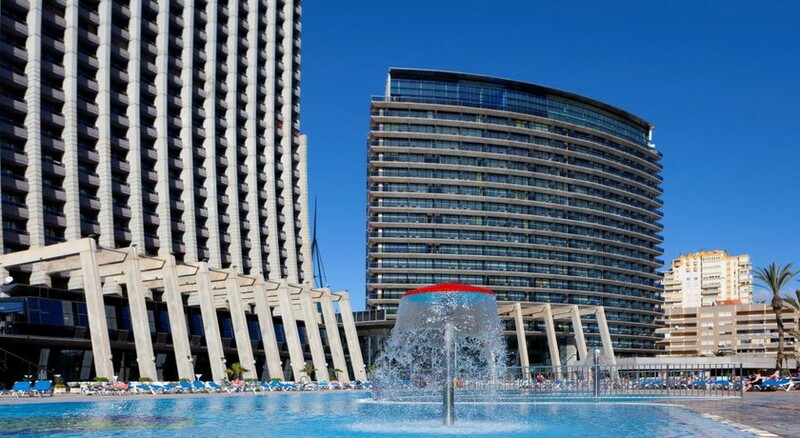 Gran Hotel Bali is located in Benidorm, just 300m from the Mediterranean seaside. There’s a golf course about 5km from the hotel. The Mundomar Marine Animal Park and Aqualandia waterpark are 11km from the hotel. The Terra Mitica themepark in Benidorm is only 3.8km. The Alicante Airport is about 54.5km from the property. You will not regret making a reservation in one of the suites that feature a whirlpool. The 776 guestrooms at the Gran Bali Hotel offer guests a warm reception thanks to a Mediterranean atmosphere and decoration, jovial and refreshing. All rooms have the necessary amenities and facilities including a bathroom with a hair dryer, telephone, satellite or cable TV, stereo, internet connection, minibar, safe and central heating. Gran Hotel Bali offers a buffet restaurant, a café, banquet rooms as well as host of refreshing drinks at the pool bar. The hotel organizes live cooking shows as well. Gran Hotel Bali has three swimming pools, a children's pool, a Jacuzzi and a sun terrace with sun loungers and parasols. There’s also a state of the art gym and a spa center. Depending on the season, a lively program of activities and entertainment is offered, with live music and dancing. We stay regularly here twice per year. This time I thought the food was not as good. Stayed for 5 days. Fantastic views. Very clean. Catered for my Disabled Mum perfectly. Excellent price. Helpful staff. This hotel is fantastic, food, rooms and all wonderful can't wait to stay again. myself and my 9 year-old son stayed at the gran bali for 7 days,it was the most friendliest hotel,staff are excellent very helpful,rooms are spotless,pools are great for kids and adults alike,definitely be going back.